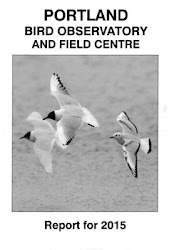 A reminder that there's an In Focus field event at the Obs between 10am and 4pm this Saturday, 26th January. Portland Bill: Red-throated Diver 16, Common Scoter 7, Mediterranean Gull 3, Black-throated Diver 1, Red-breasted Merganser 1, Black-headed Gull 1 + Bottle-nosed Dolphin 7. Southwell: Blackcap 3 (one a new arrival). Church Ope Cove: Gannet 450, Black Redstart 2. Pennsylvania Castle: Chiffchaff 1, Goldcrest 1. Ferrybridge: Mediterranean Gull 1300, Dunlin 250, Pied Wagtail 33, Turnstone 9, Ringed Plover 6, Little Grebe 3, Pale-bellied Brent Goose 3, Curlew 1. Portland Harbour: Black-necked Grebe 22, Black-throated Diver 1, Great Northern Diver 1 + Bottle-nosed Dolphin 1.